Such a cool postcard. So sad to hear its ultimate fate. Yeah it does. Still had a cool sign, though, even to the end. 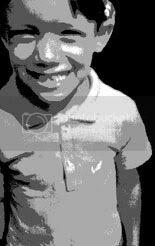 I thought of linking to those pix in the post, but eh, in keeping with the "retro" era tip here, nixed it. But I'm glad you mentioned it here, Jimmy, cuz they are neat shots!--and I'm a fan of the whole urban exploration thing. I remember hearing about a Neiman Marcus being here for a short time. But then they thought the area wasn't rich enough [when it was close to the city of Dallas (where alot of poverty is), where the flagship is]. So they moved more off to the suburbs and that's why Needless Markup only has thiry-something stores in rich suburbs. hello I'm Sharon from Dallas I will miss Bigtown.So many memories,like taking my grandma there,and getting my first ear piercing there and the street racing!!! That sign is something else. I wish somebody could salvage that and use it somewhere else. Great pics of Big Town. I also read the Dead Malls column about Big Town having a NM when it opened. I do not think this is correct. I did research at the Dallas Public Library History Center, and copied Dallas Morning News articles that showed the opening day line up of stores and the building in question was always going to be a Sanger Bros store (later Sanger Harris). Further, there was a fairly futuristic drawing of the Sanger branch publicized months earlier. I had relatives in Dallas for years and would visit as a child often and even back then, I would find it very hard to believe that the eastern part of Dallas county (Mesquite) would ever have had a NM; all of the wealth was in North Dallas where NM put a branch store in the mid 50's at Preston Center and then Northpark in 1965. 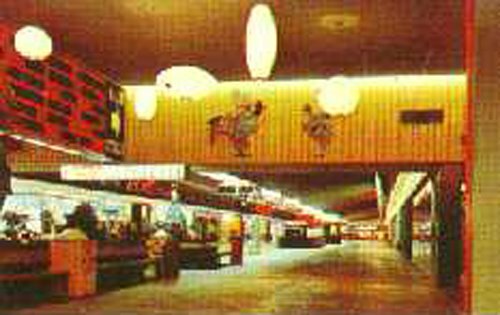 When I first move to the area in 1980, Big Town Mall was booming. It had some of the biggest store chains and a good variety. Zales Jewelers, JC Penneys, it had a book store, a record store, a shoe repair shop and even a pet store. I bought my first pet guinea pig there. It was even busy enough to have a Santa there for the children. From what I can remember, it stayed pretty busy through the '80s. By the mid '90s, it was a ghost town. Hardly any stores left and the ones that were there hardly did any business. It became a hangout for the elderly. It was cute to see them in their warm-up suits with their walkmans, power walking the length of the mall. Some of the elderly were relaxing on the benches just talking and hanging out. By the early millennium, they had closed off the interior of the mall and put outdoor entrances for any store that was still open there. The only store that I know of that lasted until the end was Hitch & Rider. I think it's a sad, pitiful thing that the owner of the mall didn't do anything to save the mall or to bring any businesses in there. A Montgomery Ward employee once told me that the landlord was being impossible about the rent and it was driving all the businesses out of there. I think he was going to turn it into an office park or something like that. What a dumbass. Big Town was a very busy place in the 60's. I was in elementary school and it was always crowded. It never had a Niemans, but was still pretty up-scale. 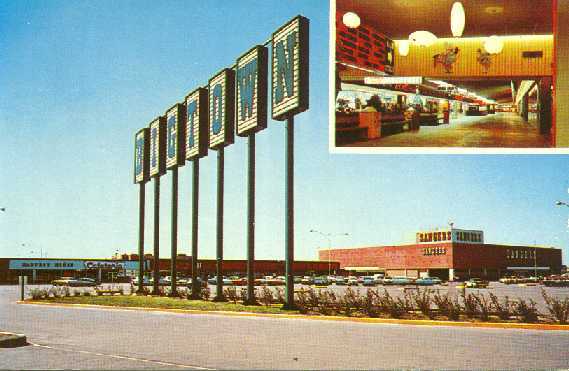 Everyone knew when Town East Mall was built just a few miles away that it would eventually be the end of BT. It took longer than I expected. By the 80s and 90s most of the chain stores were gone. The mall had one of the area's only Allied stores that became Allied Radio Shack and then just Radio Shack. The movie theatre (General Cinema) was origianly two screens. I grew up also in the 60's going to Big Town. Besides the stores there were different cool things in the Parking lot at different times. I remember at the NW corner there was a small amusement park. After that the Super Slide was fun. One year there was a show that came through with about 5 to 6 life-size dinosaurs. And a long time ago stores were not open on Sunday's. So we would learn to drive in the parking lot. When Big Town Cinema first opened me and my 3 brothers went and seen the first movie and it was "The Sword in the Stone" Days back then were not bad, to bad the kids of today want know how it was in the 50's,60's & 70's. Now we can only be nostalgic . I grew up in the early eighties and I remember my mom used to take us to Big Town as an alternitive to Town East. Town East was always so crowded, so she used to like Big Town because all the chain department stores were still open and there was a lot of other stores there too. It was pretty busy at that time. I remember there was a Santa there during the holidays. We used to eat at that snack area linked to Woolworth's inside of the mall. Sanger-Harris was boomin then! Even after Penny's closed, it was still busy. It was the demise of Sanger-Harris that brought the mall down. We used to go there sometimes in the early and mid-nineties and it was very slow and almost dead. A lot of childhood memories at Big Town. In 2006, Big Town was torn down and just driving to work everyday, seeing all the rubble was very sad. I guess nothing lasts forever. I am 57 and grew up going to big town. such great memories. one thing always comes to mind. they would bring exhibits and one time there was a hollowed out redwood tree made into what I think was a trailer home. I was very young and may not remember it exactly as it was. Does anyone remember this? I loved lollipop park as well.